Can I pay for purchase orders online? Yes, you can manage current subscriptions and view and pay invoices using the "Subscription Status" page of the "Admin" menu. You can read more about how this works here. How can I get a copy of my original invoice? You can manage current subscriptions and view and pay invoices using the "Subscription Status" page of the "Admin" menu. You can read more about how this works here. How do I access the NCM products without logging in each time? Users who would like to set up automatic login are able to do so using a custom URL. Setting up a custom URL will allow users to log in without a username and password. These instructions will assist users who have subscriptions to NCM, PNCM, and/or SNCM. If you want to create a custom URL for all NCM products, note that the URL for each subscription will be different and you will need to follow these steps for each subscription. NOTE: If you currently access the manual via the intranet, click “Log Out” located in the upper right corner of the page. You will be brought to the homepage, where you will enter your username (email address) and password, which you should have received once your subscription was activated. You will be prompted to select which subscription you wish to access. Click on “Admin” in the upper right corner of the page. Click on “Subscription Profile” on the left side of the page. Click on “IP Address” link. Enter the EXTERNAL IP range(s) of your facility’s network that you want to use to access the NCM. To add additional ranges, click on the “Add More” icon. When done, click “Save IP Addresses.” At the bottom of the page, select “IP” as the Login Method Setup from the drop-down menu. A custom URL will be generated and appear at the bottom of the page. You can use this URL to set up a link or icon on your computers or intranet to directly access NCM without using a username and password. Note: If using custom URL for any manual (NCM/PNCM/SNCM), the URL for each will be different. How do I add a companion subscription to my existing subscription? Click on "Admin" in the top right corner of the screen. Click on "Purchase Subscription" on the left side of the screen. Nte: When you begin the process to subscribe to another NCM product, the contact information will autofill with the current details on file. If you want to change the contact details for the new subscription, use the drop-down arrow where contact name appears to change it. This change will only apply to the new subscription being purchased. If applicable, enter an Academy member number "Continue." Select which manual you would like to add and how many companion subscription users should have access to your subscription. If applicable, enter your promotion code and Continue to Payment. Select payment type, fill in payment details, and purchase subscription. After your payment has processed, the NCM homepage. In the upper right corner, you will see a box with a drop-down arrow that you can use to toggle between NCM subscriptions. Note: After payment is processed, you will automatically be logged in. Click "Log Out" before exiting the program if you don’t intend to view it right away. How do I add a facility to my subscription? The administrative contact for NCM, PNCM, or SNCM will need to log in with username and password from the homepage (see “How do I log in as the administrator?”). You will be prompted to select which subscription (NCM, PNCM, or SNCM) you wish to access when you log in with your username and password. Click on the heading “Subscription Profile” on the left side of the page. Click on the “Facilities” heading, then click “Add New” on the right side of the page. Click the “Contacts” heading on the left side of the page. Select the contact currently listed. Go to the “Facility” field to click on the drop-down arrow to select a facility. The same can be done when adding new contacts to a subscription. If contacts are listed in multiple subscriptions, you must manually change their facility selection. How do I add and or delete a contact? 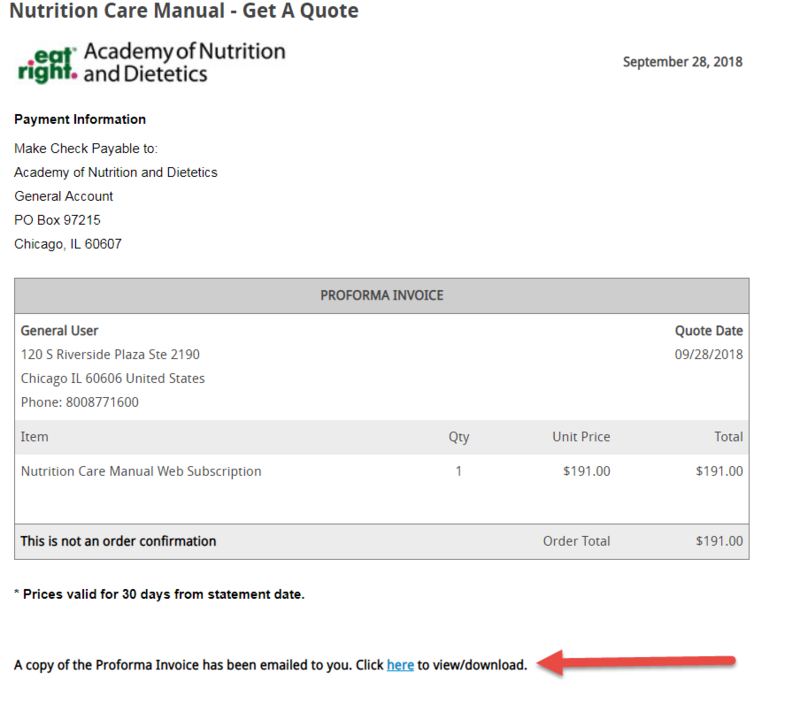 Note: Nutrition Care Manual (NCM), Pediatric Nutrition Care Manual (PNCM), and Sports Nutrition Care Manual (SNCM) are separate subscriptions. Users added to one subscription (NCM) will not automatically be added to the other subscriptions (PNCM or SNCM). Log in as the administrator for NCM, PNCM, or SNCM (see "How do I log in as an administrator?"). Click on "Admin", located at top right hand side of the page. Click on "Subscription Profile," located on the left navigation bar. Click on "Contacts" from the drop-down list. If you wish to add a contact from your companion subscription, there will be a section called “Add Related Users” that will list all existing users. You can select which users from the companion subscription you wish to add to have active in the current subscription you are logged in to. Select “User Role” from the drop-down list (administrative, technical, subscription user). Note: Unless you want the person to be an administrative contact, leave the user type as “Subscription User.” Email addresses can only be used once. 1. Click on the name who's email address will be updated. 2. Go to the "Email address" field and type over what is currently listed. Click on the name you wish to delete and below the contact information click ‘Delete’. If there is only one administrative contact you will need to add another administrative contact before deleting the previous contact. Follow the steps to add new contacts to add a new administrative contact. How do I add more licenses to my subscription? You can add more subscribers to your account at any time. If you have multiple subscriptions to NCM products (NCM, PNCM, and SNCM), you will need to complete these steps for each product. NOTE: If you currently access the manual via the intranet of a health care system and (not the internet), click “Log Out” on the top right of the page. You will be brought to the homepage where you will enter your username (email address) and password, which you should have received when your subscription was activated. You will be prompted to select which subscription you want to access when you log in with your username and password. Click on “Admin” on top right of the page. Click on “Purchase Subscription” in the left navigation. Fill in the number of subscriptions you want to add to your existing account. You will receive a message that a Member Services Representative of the Academy of Nutrition and Dietetics will contact you about your order. The details of your order request will be accessible on the Subscription Detail page. How do I add my company’s logo to Client Education materials? Single facility use: To add your company’s logo to Client Education materials, you must first log in as the NCM Administrator at www.nutritioncaremanual.org (see "How do I log in as the administrator?"). Click on “Admin” at the top right corner of the page. The "Logo" field is at the bottom of the "Subscription Detail" form. Click on “Choose File” to select a picture from your computer. The logo will appear in the upper right corner of all the Client Education documents accessible from the list on the left side of the Client Ed/Diets page. Your logo will not appear in the Client Education handouts listed in the table that appears on the Client Ed/Diets page. Click on "Subscription Profile" in the left navigation tab. Click on the name of the logo (eg, General Hospital logo). At the bottom of the facility information, you will see the logo field where you can choose your file. Once you have uploaded your logo, it will appear on all client education html handouts for all the contacts/users listed under your facility or NCM subscription. Remember: Your logo will not appear in the Client Education handouts listed in the table that appears on the Client Ed/Diets page. Quick links allow you to go directly to a bookmarked page with one simple click. All Subscription Users) can add quick links. Navigate to the page you want to set as a quick link. On the right side, below the green navigation bar, click on the plus sign (+). Log in as the Admin for NCM, PNCM, or SNCM (see “How do I log in as the administrator?”). Click on “Admin” in the top right corner of the page. Click on the name of the contact whose password you are changing. Go to "Modify Password" at the bottom of the contact’s information, enter the new password, and click "Save." The new password will be activated immediately. How do I change permission rights for a user? Log in as the administrator for NCM, PNCM, or SNCM (see “How do I log in as an administrator?”). Click on “Admin” at the top right navigation of the page. Click on "Subscription Profile" in the left navigation. Click on the name of whose permission you wish to change. Administrative contact has the ability to make internal changes such as renew, customize formulary, add users, and change user permission. Subscription user will have read-only access and cannot make changes. Technical contact will be able to set up network access within the facility. On the far right hand side, click “Add New” and complete the “Add New Contact” form. Click on "Save Profile." To change the billing contact, follow the above instructions. How do I create a facility-specific crosswalk of diets? Folllow the instructions on the Crosswalk Template Tutorial (pdf) to help create a crosswalk of diets for your facility. How do I create and manage sticky notes/markup notes? Note: If you currently access the manual via the intranet, please click “Log Out” located in the upper right hand corner of the page. You will be brought to the homepage, where you will enter your user email and password, which were sent to the administrative contact upon subscribing to NCM, PNCM, and/or SNCM. If you have subscriptions to NCM, PNCM, and/or SNCM, your username and password will be the same for all. Go to the page you wish the note to appear. Complete the fields and click “Add Note” to save. You must be logged in as the administrative contact. Click “Admin” located in the upper right corner of the page. Click “Markup Notes” on the left hand side of the page. From this table, you can view, modify, or delete any note. How do I create Facility Pages? The Administrative contact for the NCM/PNCM/SNCM subscription will need to login with their username (email address) and password from the homepage www.nutitioncaremanual.org (See “How do I log in as an Administrator?”). NOTE: If you currently access the manual via the intranet, click “Log out” located in the upper right corner of the page. You will be brought to the homepage where you will enter your username and password, which you should have received once your subscription was activated. If you have multiple subscriptions, you will be prompted to select which subscription you wish to access when you login with your username and password. To create a detailed crosswalk for your facility, select “Nutrition Care Manual,” Diet Order Template” or “NCM Diet Manual Crosswalk” from the Template drop-down menu. As the administrator of your subscription, you can create pages by simply typing text or by copying and pasting content from an existing document. You cannot add external hyperlinks to these sections. If you copy and paste from another document, formatting should be retained, but may not be in all cases. If yu cannot use your mouse to copy and paste, try using the keyboard commands (CNTRL + C for copy; CNTRL + V for paste). Cpy and paste tools are also available in the toolbar. Your facility is responsible for the maintenance of these pages and will need to check that all pages are accurate after pasting. THE CONTENT IN THESE AREAS ARE IN NO WAY ENDORSED OR MANAGED BY THE ACADEMY OF NUTRITION AND DIETETICS. Where will the users be able to view the Facility Pages? Once the facility page has been created, all users on your account will be able to see the “Facility Pages” heading by clicking on the “Client Ed/Diets” tab and scrolling to the end of the Conditions listed on the left side of the page. How do I customize the formulary database? 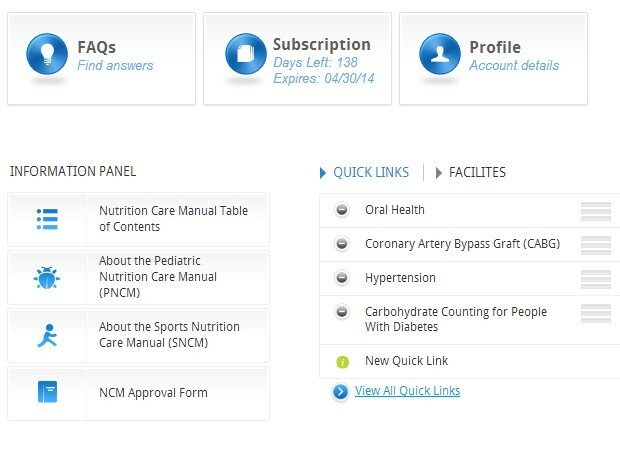 You can customize your subscription so that the formulary list appears with the nutritional solutions available at your facility displayed (with checkmarks) at the top. 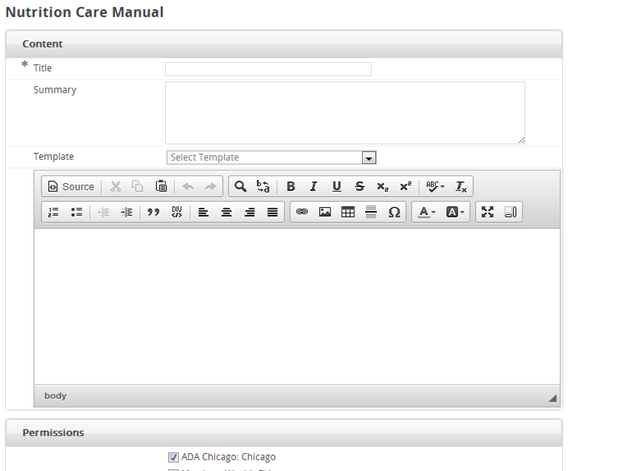 This will allow you to create an “electronic” formulary card for NCM users at your facility. Note: If you have subscriptions to multiple NCM products (NCM, PNCM, or SNCM), you will need to customize each formulary list separately. To start, you must login as the Administrator contact for your subscription at www.nutritioncaremanual.org (see “How do I log in as an administrator?”). Note: If you currently access the manual via the intranet, click “Log Out,” located in the upper right corner of the page. You will be brought to the homepage where you will enter your username (email address) and password, which you should have received once your subscription was activated. If you have subscriptions to more than one NCM product, your username/password will be the same for all subscriptions. Click “Admin” at the top right corner of the page. Click “Formulary” on the menu on the left side of the page. To select the solutions, click on the boxes to the far right of each formula. To select all, click the “All” button located above the "Select" column.. When you are done selecting the formulas to display for your staff, click “Save Selections” at the top of the table before selecting a new formula type. Repeat this process for all formula types you want to include. How do I download the backup PDF of NCM or PNCM? You can download a backup PDF of NCM or PNCM to save to a flash drive or CD. 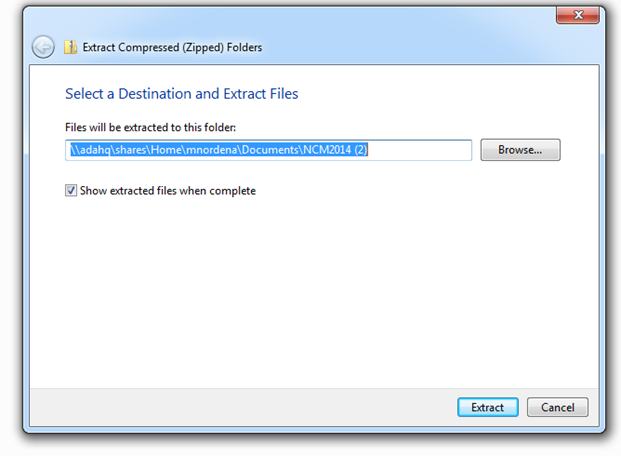 NOTE: Your NCM backup files will be downloaded in a .zip format. This folder will contain three additional .zip subfolders with the essential backup information from NCM: NCM Conditions section, the NCM Client Education Handouts, and the NCM Diet Manual. The administrative contact for the NCM subscriptions will need to log in with their username (email address) and password from the homepage www.nutritioncaremanual.org . If you currently access the manual via the intranet, click "Log Out" located in the upper right corner of the page. You will be brought to the homepage where you will enter your username and password, which should have been received upon activation. If you have multiple subscriptions, you will be prompted to select which subscription you want to access when you log in. 1. Click on "Admin" located in the upper right corner of the page. 2. Click on "Download Backup NCM PDF" in the menu on the left side of the page. 3. Read and accept the disclosure regarding download the backup files once annually. 5. You will need to repeat these steps to download PDFs for each NCM product. You may only download the PDF once; therefore, be prepared to download the PDF and save in a folder. If you access NCM, PNCM, and/or SNCM via your intranet, click “Log Out” at the top right corner of the screen. You will be redirected to the NCM homepage where you will enter your email address and password that were sent to you when your subscription was activated. Note: If you have subscriptions to more than one NCM product (NCM, PNCM, and/or SNCM) your username (email address) and password will be the same for each NCM product. You will be prompted to select which subscription you wish to access when you log in with your username and password. You are now logged in as an administrator for the selected subscription. Once you are logged in as the Admin, you may implement the customization features. Click on the "Admin" button at the very top right hand corner of the page to view available functions. Note: NCM product subscribers identified as “Subscription User” are unable to perform the tasks listed above. Subscription Users are limited to read-only access. Note: NCM, PNCM, and SNCM are separate subscriptions, so if you subscribe to more than one NCM product, your renewal dates may be different depending on when your subscription was initially activated. You will need to repeat the following steps to renew each of your subscriptions. Note: if you currently access the manual via the intranet, click “Log out” in the upper right corner the page. You will be taken to the homepage to enter your username and password, which you should have received when your subscription was activated. If you have multiple subscriptions, you will be prompted to select which subscription you are renewing. You can also click on “Admin” in the upper right hand corner of the page to access the admin page. Click on the orange banner with the “Renew Now” link. Select whether or not you will use an Academy Member number. Verify the number of subscriptions you are renewing. How do I request a quote/proforma invoice? The Administrative contact for NCM/PNCM/SNCM subscriptions will need to log in with their username (email address) and password at www.nutritioncaremanual.org (see “How do I log in as an administrator?”). NOTE: If you currently access the manual via the intranet, click “Log Out” located in the upper right corner of the page. You will be brought to the homepage where you will enter your username (email address) and password, which you should have received once your subscription was activated. If you have a subscription to more than one NCM product, you will be prompted to select which product you want to access after you log in with your username and password. Click on “Admin” in the upper right corner of the navigation bar. Click on “Get Quote” in the navigation box on the left side of the page. Once done, you will be given an option to print or email a quote. How do I run Usage Statistics for my subscription? Usage statistics will help you determine how frequently your NCM subscription is being accessed by users. Only the Administrative contact for the NCM, PNCM, or SNCM subscription will be able to run usage statistics. Log in with your username and password from the homepage. www.nutritioncaremanual.org . (See “How do I log in as the administrator?”). Note: If you currently access the manual via the intranet, click “Log Out” in the upper right corner of the page. You will be brought to the homepage to enter your username (email address) and password, which you should have received when your subscription was activated. Click on “Admin” located in the upper right corner of the page. 6. Click on “Download” on the right side of the list to download the results to an Excel spreadsheet and save for your records. The downloaded spreadsheet is editable, so you can adjust the format to your preference. If the users accessing your subscription exceed the number you have purchased, you will not be able to access the manual. A record of this is documented, and you can see the overflow report in the table titled “Recent Log,” which appears at the bottom of the “Filter Reports” field. This report can be downloaded as an Excel spreadsheet. If you are experiencing overflow errors on your NCM account, increasing the number of licenses/subscriptions purchased is recommended. How do I update my IP ranges? Setting up a custom URL will allow users to log in without a username and password. These instructions will assist users who have subscriptions to NCM, PNCM, and/or SNCM. Different IP ranges can be added for each subscription. The administrative or technical contact for the subscription should log in with username and password from the home page (see “How do I log in as an administrator?”). Note: If you currently access the manual via the intranet, please click “Log Out,” located in the upper right hand corner of the page. You will be brought to the home page, where you will enter your username and password, which were sent to the administrative contact upon subscribing to the NCM. You will be prompted to select which subscription you wish to access after you log in with your username and password. Click on “Admin” in the upper right hand corner of the page. Click on “Subscription Profile” on the left hand side of the page. Enter the external IP ranges of the computers you want to be able to access the NCM. To add additional ranges, click on the “Add More” icon. When done, click “Save IP Addresses” and at the bottom of the page choose “IP” as the log-in method setup. When do I need to log in as the administrator? Can I reprint or adapt information from NCM/PNCM/SNCM? If you wish to distribute NCM client education materials to patients and clients, you are not required to seek Academy permission. However, because client education materials are protected by copyright, you may not modify any portion of the handout EXCEPT patient-specific recommendations added to the clearly marked Notes and Sample Menu sections in the documents without prior written consent of the Academy. To obtain permission to reprint or adapt any other material from the NCM, PNCM, and/or SNCM for publication in another source (print or electronic), complete this form and attach it to an email to the Academy’s permissions editor (aswarn@eatright.org). How do I cite content from the NCM/PNCM/SNCM? Manual. http://www.nutritioncaremanual.org. Accessed [date you visited the site]. Academy of Nutrition and Dietetics. Pediatric Nutrition Care Manual. [Page Title, including condition name]. [URL for specific page]. Accessed [date]. Because NCM products are updated annually, note that it is critical that your citation includes the date you accessed the material. Beginning with the 10th edition, the AMA Manual of Style (published in 2007) advises authors to print a hard copy of electronic sources they cite, in case the electronic version is replaced or deleted. What are the technical specifications to run Nutrition Care Manual products on my computer? Disable pop-up blockers so that new browser windows can launch when you access printer-friendly client education handouts, references, and external websites. If you are unable to log in, or if you are receiving the error message, “Your subscription currently requires IP Authentication,” send an email describing the issue to NCMSupport@eatright.org. Which compliance standards do the NCM products meet? All NCM products are consistent with the Centers for Medicare & Medicaid Services’ Interpretive Guidelines for the Hospital Conditions of Participation. NCM meets the Joint Commission’s Hospital Accreditation Standards. NCM complies with DNV's National Integrated Accreditation for Healthcare Organizations (NIAHO) accreditation program. Note that NCM has been named the preferred diet manual by the Healthcare Facilities Accreditation Program. Click here for more information about regulations. Are translations of NCM® Client Education handouts available? Yes! We offer select handouts in Spanish and Chinese. Over 200 client education handouts are available in Spanish. Yes! We accept payment by credit card or purchase order for institutional subscriptions. Individual subscriptions, however, must be paid with a credit card. Can my facility access the NCM® using our own intranet or electronic medical record? Yes! Our technical support team (ncmsupport@eatright.org) can assist you in coordinating IP authentication to provide seamless NCM® access to everyone at your organization. Can NCM be shared institutionally across multiple sites? Yes! We are able to customize your settings to grant NCM® access to multiple health care facilities or sites within one institutional account. Do subscribers affiliated with GPOs receive a discount? Yes! Please contact ncmsales@eatright.org for more information. Does NCM® have a mobile app? Our web platform is enhanced for mobile users who prefer tablets or mobile devices. We do not offer a NCM® app at this time. How can I make NCM available offline to satisfy compliance requirements? Your subscription to NCM® includes one copy of NCM®’s backup PDF which can be downloaded once annually. These files provide you access to all NCM content (including client education handouts) in a format which does not require internet access. These backup materials can be saved to a USB or printed and stored in a community location to satisfy the requirement of regulations. How do I access NCM® subscriber content? Please visit nutritioncaremanual.org and login with your username and password. How many people can access NCM® at one time? This is determined by how many NCM® concurrent licenses you have purchased. Your licenses will allow simultaneous NCM® access to the number of licenses you have purchased. For example, if you purchase five NCM® licenses, up to five users could access NCM® at the same time. If a sixth individual attempts to access the NCM® while the other users are logged in, they will not be able to access (until another user logs out). The administrator of your NCM® account will be able to track these instances to make adjustments to the number of licenses on your account. Best Practice: When purchasing a NCM® subscription, plan to provide access for every dietitian at your facility to ensure uninterrupted access for your team. If other members of the health care team (such as nurses or physicians) will be accessing the NCM®, we can help you determine the ideal number of licenses for your account. How often in NCM® updated? Our websites are updated by content experts annually, which exceeds the regulatory needs to update a diet manual every 5 years. All NCM® subscribers are alerted to new content updates via email and announcements posted on the NCM® website. I work at a university. Can NCM® be accessed on campus and off campus? Yes! NCM® can be accessed anywhere in the world with an internet connection. Is a hard copy of NCM® available? A PDF of NCM® content is included in your NCM® subscription and provides access to all NCM® content. This file can be printed if a hard copy is desired. However, this is not recommended because it will print the contents of the entire website (several thousand pages). Is automatic NCM® renewal available? Yes! As of September 2018, all institutional NCM® users will be automatically enrolled in our new auto-renew feature. If you would prefer to manually renew each year, you can opt out by adjusting the default settings in your NCM® admin control panel. Which internet browsers are supported by Nutrition Care Manual® products? We would love to answer any additional questions you have about our products. How do I add my logo to the client education handouts? Administrators can add their facility logo in the administration section of the site. This will allow the logo (or other graphic if you choose) to show up on client education handouts when printed. How do I customize the 1-day menu? You can customized sample 1-day menus using the US Department of Agriculture Nutrient Database. A step-by-step tutorial is available via the “Nutrition Care Manual Sample Menu Modification Tutorial” link on the Client Ed/Diets page. How do I print the client education handouts? Click on “Download Client Ed.” You will be given the opportunity to customize the contact information for you, your organization, and your client, as well as add notes. You can print all of the information in a client education handout or just sections. Click the sections you’d like to print, or click “All Content” if you want to print the entire document. How do I view a nutrient analysis of the sample menus in the NCM? All online versions of the 1-day sample menus contain a link to the USDA Nutrient Database. Scroll down to the sample 1-day menu for a given condition to view the daily sum report which includes the total energy (calories), protein, carbohydrate, fiber, and sugar content of the menu. For additional details about the specific breakdown by meal or to view all micronutrient information, click on “View Nutrient Info” link to access the full nutrient analysis report. NCM tracks the terms you search for most often. These results are listed to the right under the green bar on the homepage after you’ve logged in. You can click on each term to view the pages where these terms appear. I am having problems accessing my subscription via the custom link. Log in as the administrator or technical contact with your username (email address) and password. If you do not know your login information, contact NCMSupport@eatright.org. Click on the “Admin” link in the upper right corner of the screen. Under your “Facility” name, you will see the list of external IP addresses for your facility. To add a range, click “+ Add More.” Please note, you must add the external IP. address(s) of your facility’s network and not the IP address of each individual PC. Before testing your link via your intranet, please click “Log Out” in the upper right hand corner. What should I do if I don’t see the menu options in the green menu bar? If you do not see menu options in the green menu bar in the Nutrition Care Manual, you are viewing the site in Internet Explorer's Compatibility Mode, which causes issues in rendering some newer features of HTML. Go to Internet Explorer and click the Alt key to temporarily display the menu bar and click on Tools. If there is a checkmark in the box for “Display intranet sites in compatibility view, click the box to remove the checkmark.